Nike's marketing pitch: Soft, responsive support. 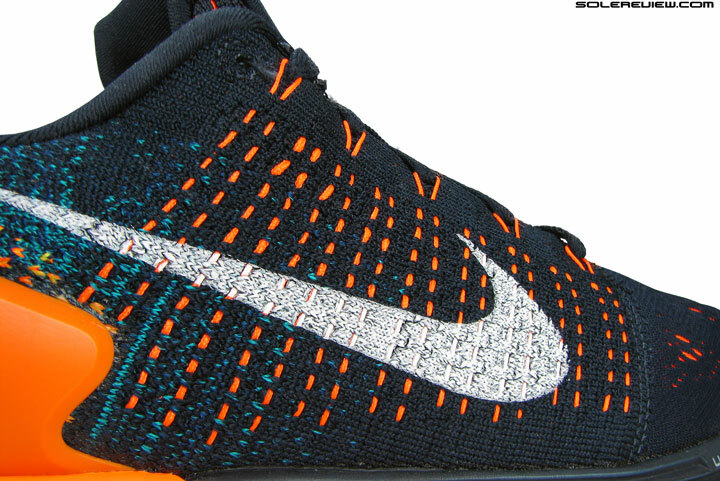 Upper: Combination of Flyknit fabric and engineered mesh. No midfoot sleeve. 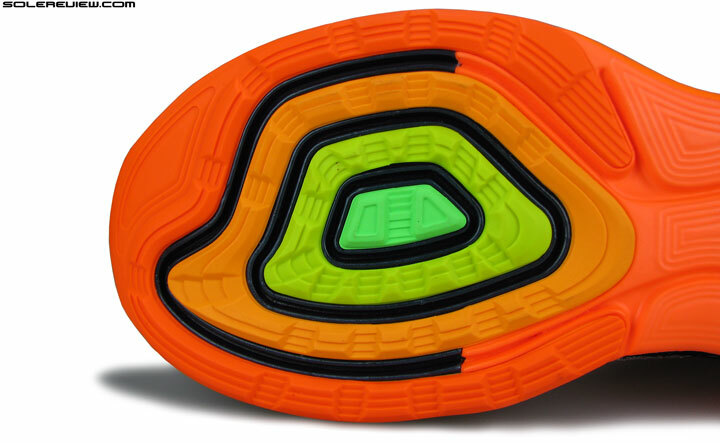 Midsole: Lunarlon seated within an injection molded EVA midsole. Widths available: Single - regular (reviewed). Wide width only available as a NikeID option. The Lunarglide 7 shares the same sole with the LG6; the ride is similar but is made softer by changed foam density. Plenty of updates happen on the upper, all of which results in increased space inside. Not your regular ‘support’ or ‘guidance’ shoe, this one. If you went by standard definitions of ‘neutral’ and ‘motion control/stability’, the Nike Lunarglide 7 does not fit into either category. The absence of a firmer medial midsole does not make it a traditional support shoe, and the presence of a firmer foam casing wrapped around a softer Lunarlon foam core sets it apart from a neutral shoe. So what is the Lunarglide concept, then? The way we see it, it is a neutral shoe in a support guise. It wasn’t always like this, however. A bit of a history lesson will come in handy here, for which we’ll borrow the graphic from last year’s LG6 review. If you’re not reading this on a smartphone, click/zoom-in on the picture to enlarge it. The evolution of the Lunarglide. The 7th iteration carries over midsole basics from the LG6. It all started with the 2009 Lunarglide, which did something unique. It strayed from the tried and tested ‘neutral’ and ‘stability’ template, and instead chose to plonk in an angled Lunarlon wedge encased within a firm EVA midsole. 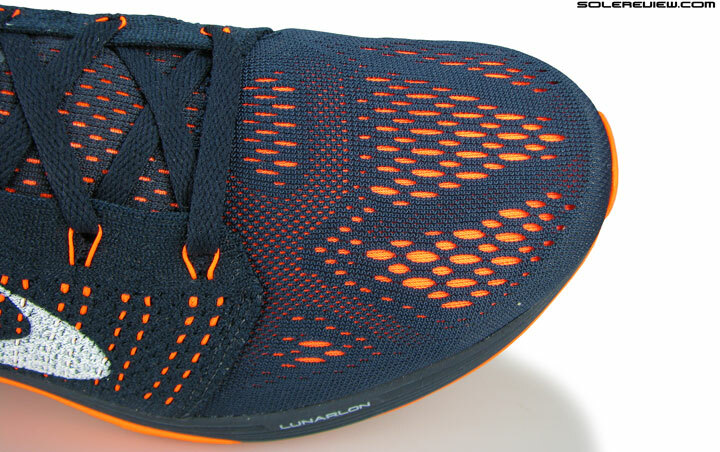 Three years later, Lunarlon came out of its hiding place and evolved to form an opposing wedge, stacking up with the firmer EVA midsole (see picture above) on the inner side. That was the Lunarglide 4 and 5. In 2014, the redesigned Lunarglide 6 put the Lunarlon foam back inside the firmer midsole, but left it exposed in the forefoot. So what you ended up with was a hybrid of the past two Lunarglide versions. 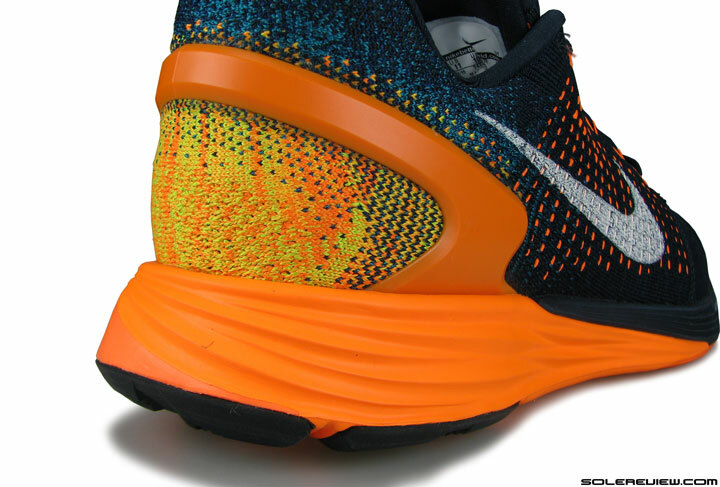 To avoid alienating existing users of the LG4 and 5, Nike played smart and painted the LG6 heel in the likeness of Lunarglide 5’s stacked midsole design. It was meant to convey the impression that the medial (inner) and lateral (outer) sides had different hardness levels. No, that diagonal line does not divide the midsole into softer and firmer stacks. It’s the same density across, and the paint is merely a visual effect – regardless of what Nike would have you believe. 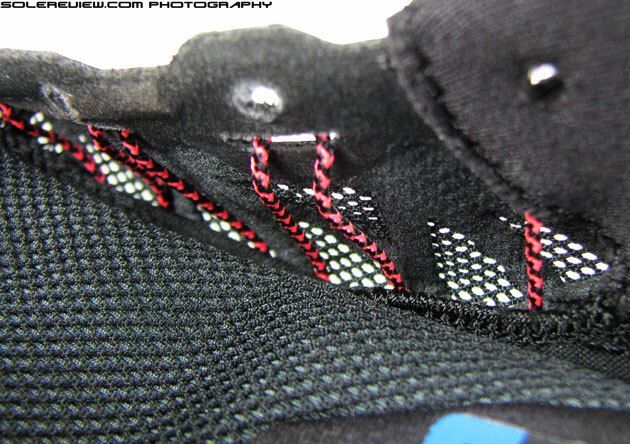 This is how the Lunarglide midsole looks like inside. 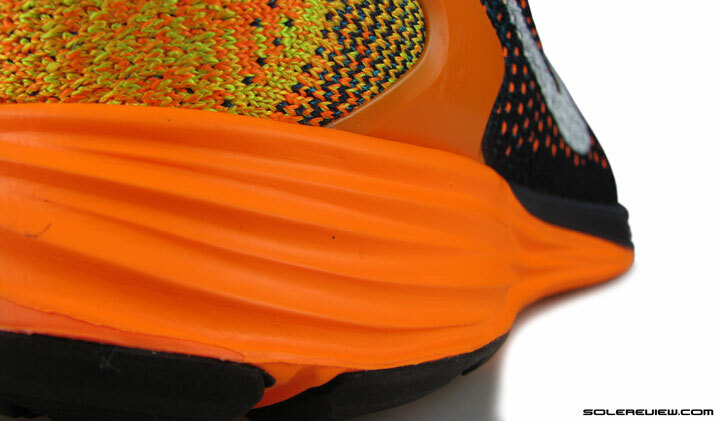 Basically, there’s a soft Lunarlon foam core (black) surrounded by a firmer midsole casing (orange). This picture is that of the Lunarglide 6, but digitally color corrected to resemble the LG7’s color combination. 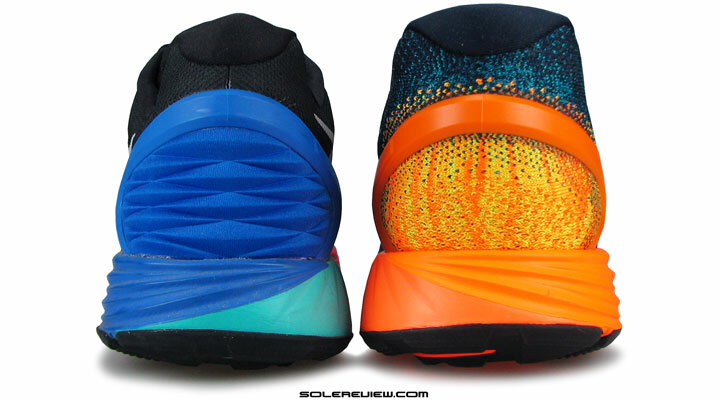 The midsole wall thickness varies only slightly between the medial (left) and lateral (right) sides. 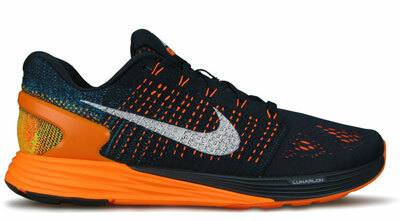 Essentially, the Lunarglide is a neutral shoe with a supportive element in its ride character. 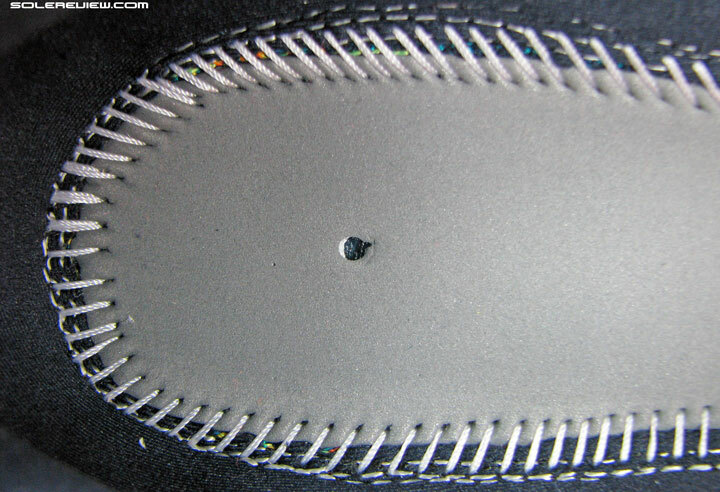 This cross section shows Lunarlon’s stacking arrangement inside the midsole. 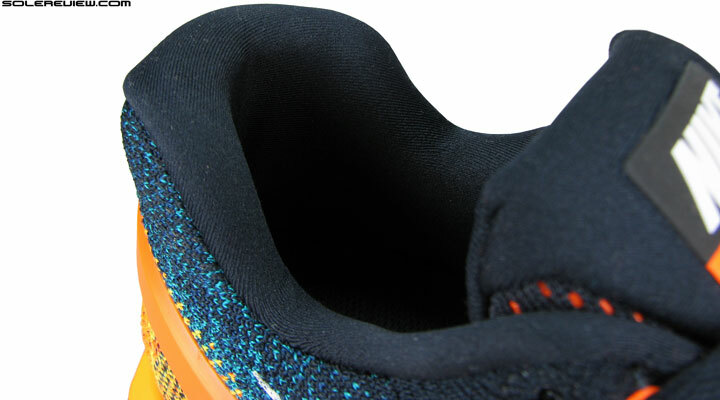 However, the reality was something like this: the Lunarlon foam is inside the midsole, but not in an angular, beveled shape. It is placed within like any other cushioning insert, making the center soft with the firmer sides playing the role of support structures. Agreed, the Lunarlon core is not perfectly symmetrical, but the lateral and medial curves only differ by a small margin. And thats’ what we meant by Lunarglide being a supportive neutral. It does not feel like other motion control shoe, but instead delivers a supportive ride without any bias. Because of the design change, the LG6 rode firmer than the LG4 and 5. While the Lunarglide 7 comes built on the same platform as the Lunarglide 6, there are a few functional updates. Same midsole, so are the Lunarglide 6 and 7 very similar? No, they differ quite a bit, especially in the way how the upper fits. There’s a variation in the ride too. 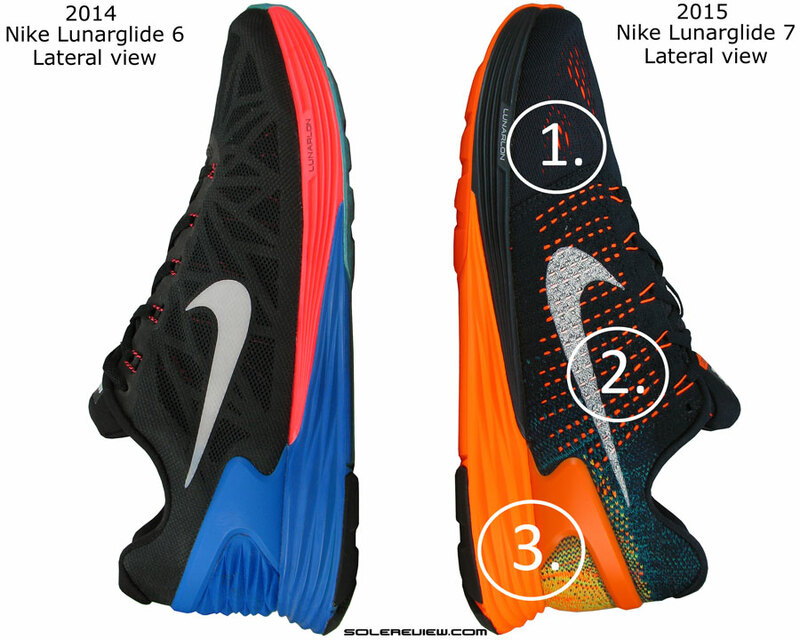 In theory, the Lunarglide 6 and 7 should be similar because of shared parts such as the sole and the upper last. Except that they aren’t. The Lunarglide 7 rides and fits differently. The upper fit in particular has so many changes compared to last year that using the LG6’s upper as a reference seems redundant. Before getting into the thick of it, we’d like to let you know that we see the Lunarglide 7 as an overall improvement over the Lunarglide 6. That being the case, the total score awarded to the LG7 will come into question as it is lower than what we gave the LG6. There are a couple of reasons. With increased review experience, our scoring mechanism has evolved in the past year, and we now take a far more critical view of the shoes reviewed. Which means that shoes such as the LG6 and Energy Boost would have scored lower than 90% if reviewed today. That’s the first reason. The second factor involves Lunarglide 7’s $15 price increase over the LG6, and these kind of price jumps makes our scoring spreadsheet nervous. With that caveat out of the way, let’s give the new Lunarglide 7 the full solereview treatment. This should look familiar. 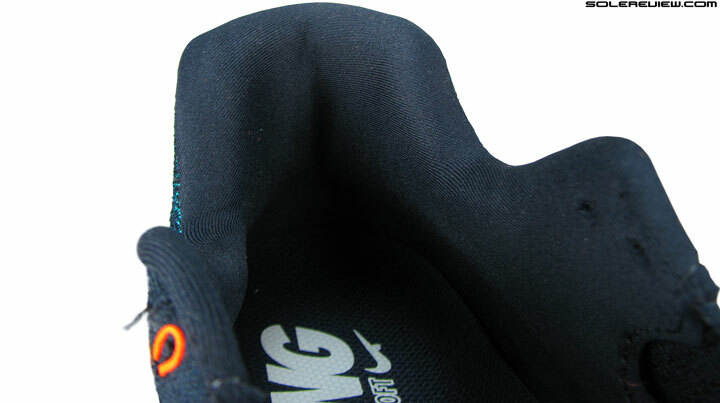 A soft Lunarlon midsole overlay (in black) emerges from inside the heel/midfoot, and extends towards the forefoot. What’s instantly obvious is that the LG7 has used the identical sole design as the Lunarglide 6. It is a dual density set-up with the firmer part forming the outer midsole under the mid and rearfoot, and exposed Lunarlon foam under the forefoot. Same footbed design, only softer. What’s not so apparent is what goes on inside. A few changes here and there affects the LG7’s ride manners, something you’ll notice as early as during your first run. The most telling of all changes is the removable insole. From a design overview, nothing seems amiss as the footbed looks exactly the same. Molded foam with mesh, with some descriptive text printed over the heel. The longitudinal lines were present on the Lunarglide 6 too. 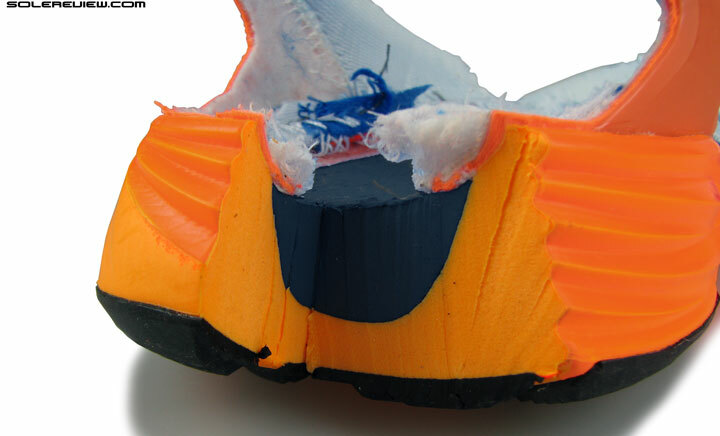 The foam lasting between the insole and the midsole. Like the insole, it turns softer. Black Lunarlon insert can be glimpsed through the hole meant for lasting alignment. The outer midsole covering is softer than the LG6. The reverse face of the insole has deep channels running lengthwise, though we’re not exactly sure what this does. Based on our experience, these grooves have the effect of making the insole cup easier around the foot. Between the insole and the midsole is the foam lasting, and this too goes from firm to soft. And finally, the firmer outer midsole with its accordion-like sidewall design drops a few levels in density, becoming softer in the process. At first, it wasn’t evident. It was assumed that the soft insole was causing 100% of the changed feel. But when we swapped the new insole with LG6’s firmer one, the LG7 still felt softer. 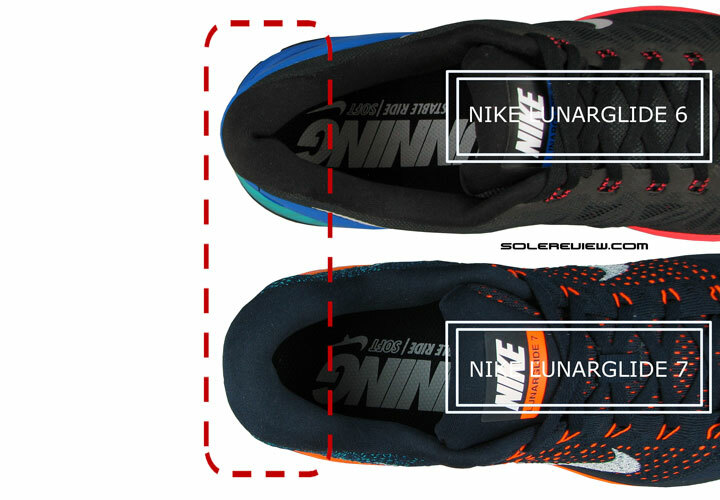 The Lunarlon core inside hasn’t changed at all in density, leaving us with the midsole casing as the only other variable. And it is indeed molded softer, and it is easier to compress than that on the Lunarglide 6. Still, what really swings the ride around is the revised insole. It does make the rearfoot cushioning go softer, but it ends up affecting the ride quality regardless of where you load weight. The forefoot for instance, now feels a little more responsive. 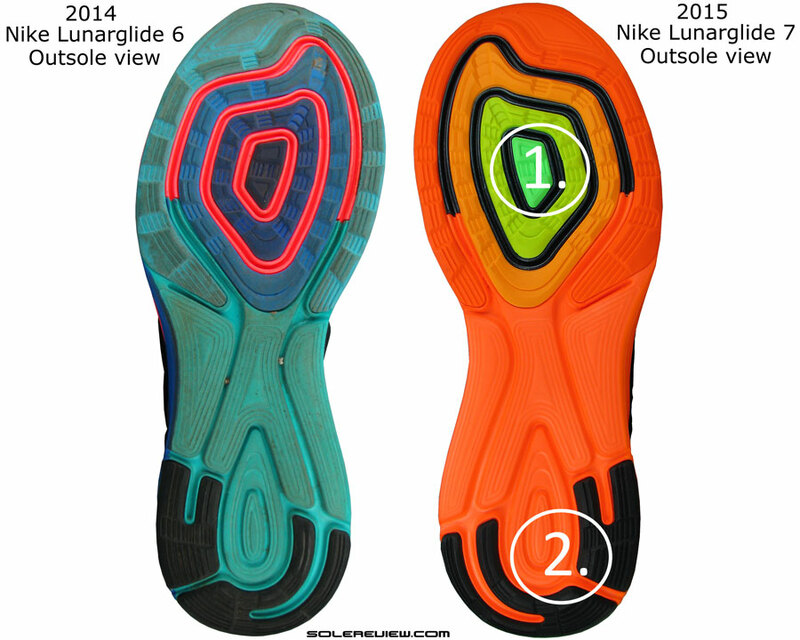 LG7 has the same outsole design introduced on the Lunarglide 6 last year. The midfoot and rearfoot is mostly EVA foam, except for the horse-shoe shaped rubberised reinforcement under the heel. Under the forefoot, there’s plenty of action owing to how the outsole is designed. 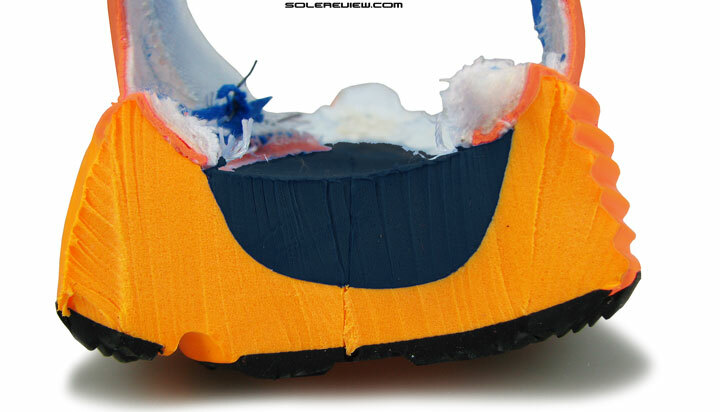 The entire contact area under the front is covered with rubber. Specifically speaking, concentric rings of geometrically shaped rubber mounted on a combined base of EVA (orange) and softer (black) Lunarlon. These effectively work as pistons, depressing inwards with forefoot strike or simply under weight loading. The novel ‘pressure mapped’ design has an inherent ‘pistoning’ effect. A softer insole increases that sensation of springback. With Lunarglide 7’s softened insole, the ‘pistoning’ sensation is heightened due to easier transmission through the midsole. This makes the LG7 feel more responsive under the forefoot compared to LG6. 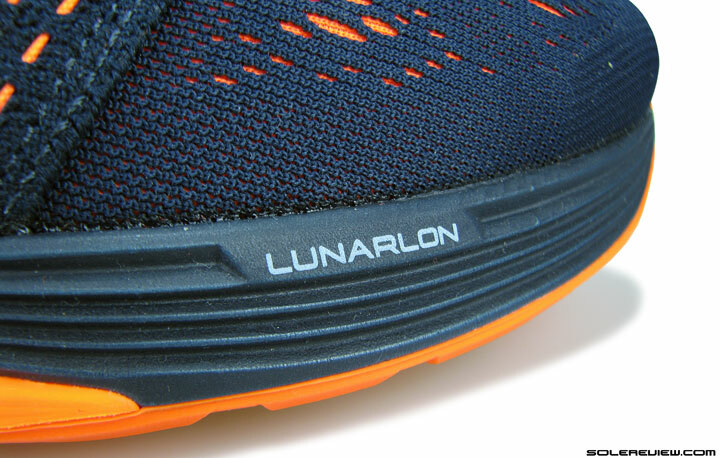 Softer Lunarlon forms the bulk of forefoot cushioning, making it softer than the rearfoot. The present Lunarglide still remains a great option for forefoot strikers, who not only seek substantial forefoot cushioning, but some measure of responsive behavior. The pre-existing, LG6 set-up of 100% Lunarlon had made the forefoot a comfortable place, and now only more so with the LG7’s softer insole. The single density Lunarlon insert extends from heel to toe, and the outsole is full contact, so that makes for smooth transitions. There are no soft zones, and the cushioning feel is very consistent. The medial side of the LG7. Firm sidewalls keeps foot roll in check on either sides. The ride is extremely supportive too. 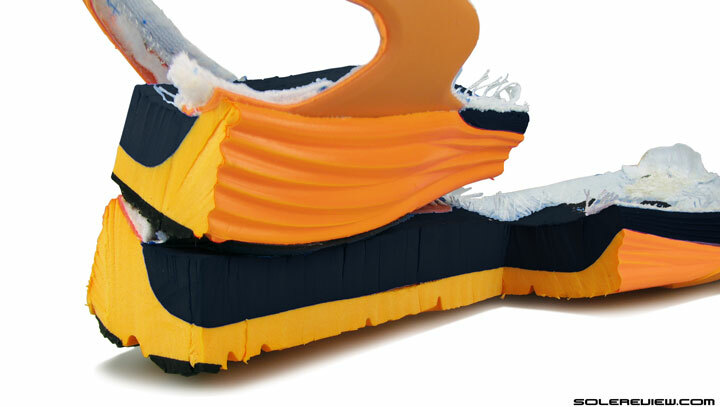 The softer Lunarlon embed makes sure than your foot is seated right in the center, and the wide rearfoot base made of firmer foam makes sure that there is no sideways lean or roll. At the same time, you can’t discount the role of the LG7’s upper when it comes to providing support. The plastic heel counter is a key player when it comes to delivering support, and that too has undergone a significant redesign. 1) The forefoot is more cushioned than before. Concentric rings reduce flexibility, and the grip isn’t great 2) Softer heel cushioning due to changed densities of the insole, lasting foam and the midsole casing. The heel has a decent amount of outsole rubber, but the very low area of contact patch makes for less than ideal traction. See how high the sides curl up around the edges. Nike’s concentric forefoot design, which the brand calls ‘pressure mapped’, isn’t without its drawbacks. The rubber lugs don’t provide a high level of grip, less so when compared to shoes such as the Pegasus 32. It also fares poorly on smooth, damp surfaces. The rearfoot has scant rubber coverage from a contact perspective. At first, it might seem to have a lot of rubber, but the actual contact footprint is much smaller. 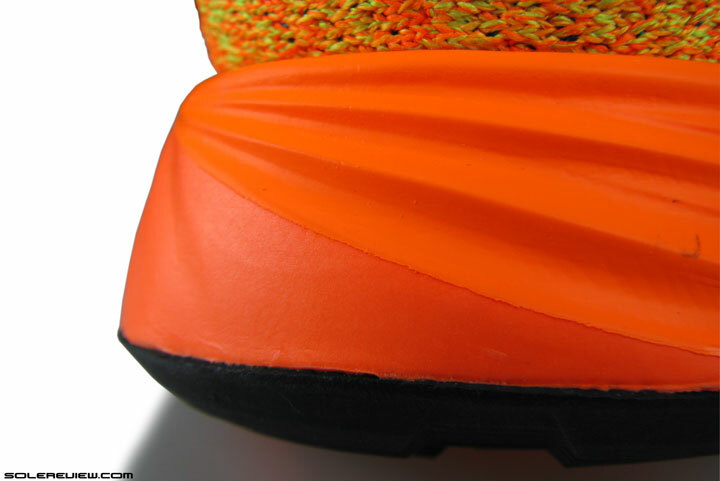 A lot of the rubber is stuck under the highly angled edge of the outsole. While this is good for gradual landings and transition quality, it does little for grip. The second shortcoming is that if you’re running on surfaces littered with small debris, these get lodged inside the midsole grooves. Now small stones and the like get trapped under shoes all the time, but since the grooves on the Lunarglide run lengthwise instead of sideways, the small things stay put. A traditional side-to-side groove would have otherwise released small debris each time they flexed, which isn’t the case on the LG7. And speaking of flex, the concentric design makes the forefoot rather stiff. Can’t say this to be a good thing or bad, because it works either ways. Regardless of where you land, the midsole transition is well mannered. The overall ride quality is very civil, very balanced in its feel. It is cushioned, but with a hint of firmness coming from the dual density midsole design. Transitions are pleasing, and help keep up the pace without the distraction of energy-sapping soft spots. Considering all that’s going around, the fact that the shoe manages to stay below the 300gm/10.6 Oz threshold is quite remarkable. It nearly weighs the same as last year, but if you have to be specific, the LG7 is lighter than the LG6 by a few grams. Being lightweight, the Lunarglide 7 carries itself over distances very well. Its ‘fast’ feel isn’t on the same level as the LunarTempo (which is an entirely different shoe, by the way), yet works out well for fast paced daily training. 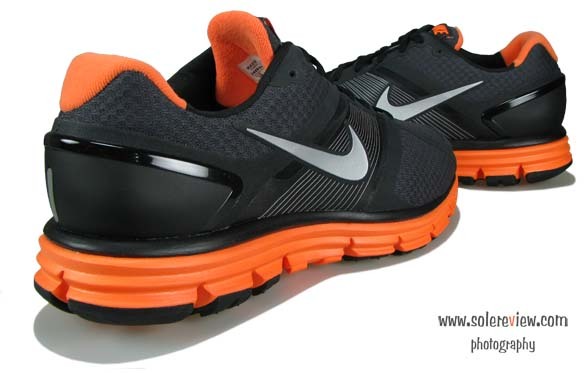 And by now, you would have figured out that the Lunarglide 7 is more comfortable, more cushioned than the Lunarglide 6. The way we would treat the new Lunarglide is as a supportive neutral shoe with adequate cushioning. Which means that you should not let words like ’stability’ and ‘support’ scare you – as underscored much earlier in the review, the Lunarglide 7 isn’t in the same vein as traditionally known ‘motion control’ shoes. The picture of the dissected midsole is proof enough; the beveled angle of the Lunarlon is benign. A shoe is nothing but a lot of things coming together to produce a certain result, and what really distinguishes the Lunarglide 7’s personality is its redesigned upper. This will be followed by a question: What has changed in the new upper? The Lunarglide 7 goes through a major wardrobe change. The forefoot is now engineered mesh, or what Nike prefers to call Flymesh. 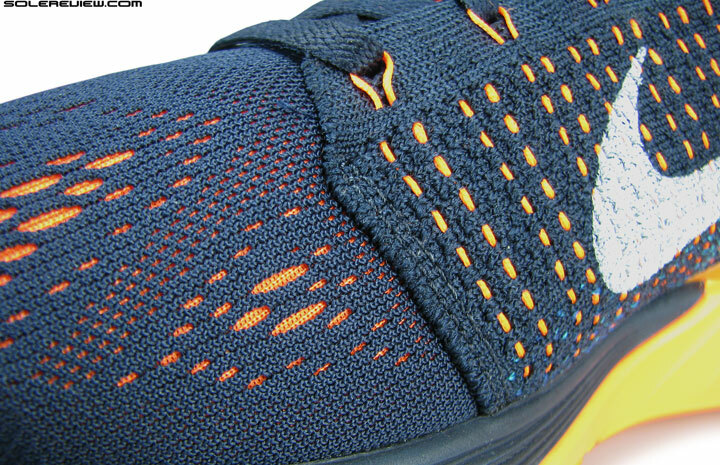 The Flyknit panels used here are very Flyknit Lunar 3 type. 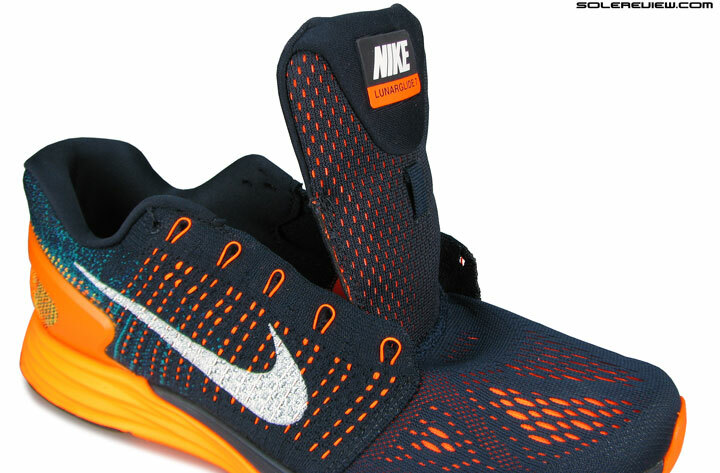 This is the non-stretch version, unlike the type used on the Nike Free line. Start delving into the basics of materials and construction, and you’ll quickly discover that newness is sewn into every fiber of the LG7’s upper. 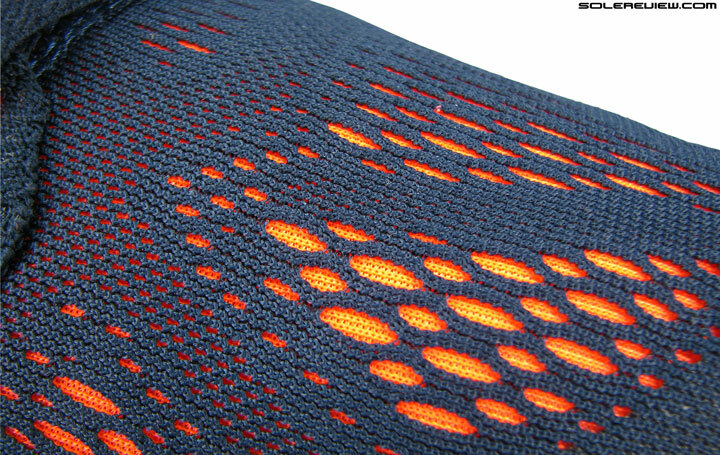 The mesh is now a Flyknit-engineered mesh hybrid. The forefoot has engineered mesh, a term used to describe a single piece fabric with different types of structures. There are holes in some parts for ventilation and flexibility, while other parts have tighter pores or densely knit support structures. This is similar to what you saw on the 2012 Lunarglide 4 and 5, except for one crucial difference. Surprise! No midfoot sleeve or gusset. The lining however, has a sponge like quality to it, making the innards comfy. 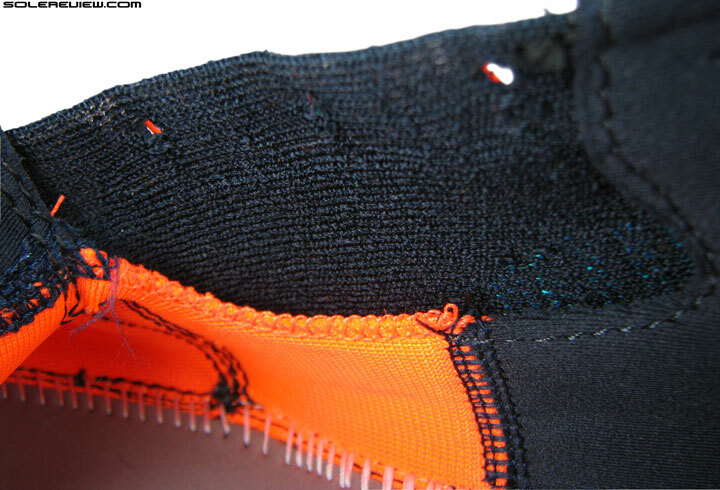 The lining inside isn’t a flat mesh like on the Lunarglide versions 4-6. 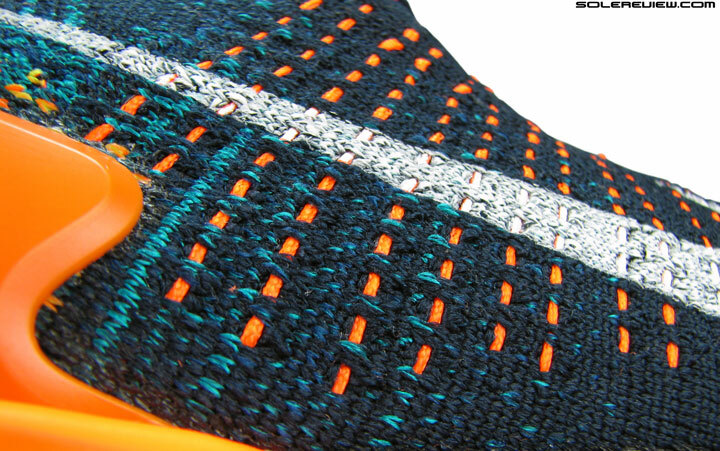 In this case – where the lining also doubles up as a forefoot slip – the textile has a spongy feel to it. This alters the way how the interior environment feels over the foot, doing so in a way which delivers increased comfort when compared to last year’s design. 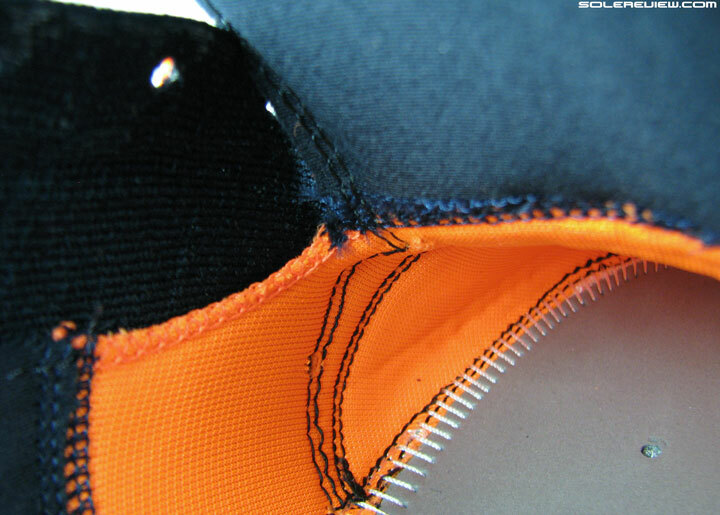 The Flywire threads find their way through channels knit into the panels, instead of working independently. Flywire lacing is also used on the LG7, but in a different avatar. Unlike last year, where the cords ran between the outer upper and inner sleeve, the LG7’s Flywire is similar to Flyknit Lunar 3’s design. 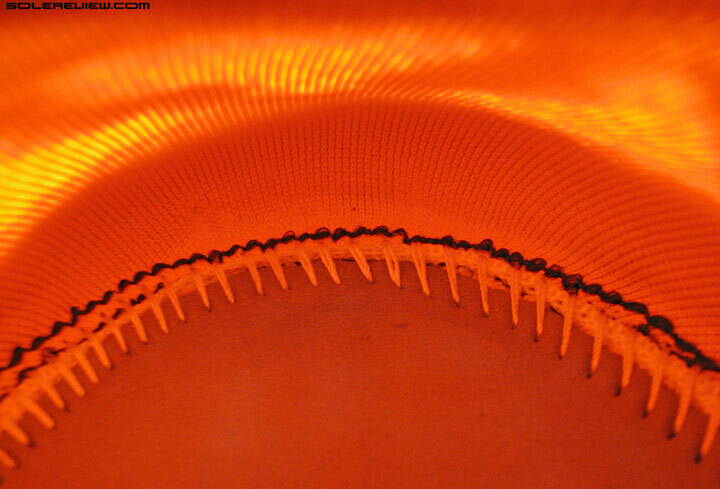 The cords run entirely on the outer surface, burrowing through tunnels knit into the midfoot panels. Two layers of upper separate the Flywire cords from the foot, completely eliminating pressure from the strings. No midfoot sleeve means that the tongue can be raised over upright. And did someone say inner sleeve? That part is also updated, or should we say, left behind with the LG6. There isn’t a midfoot sleeve anymore. You can lift the tongue far enough to stand on its base, and if any sleeving happens, that’s restricted to forefoot only. This redesign has an obvious consequence on the fit too. The internal toe-bumper has a raised and rounded profile. This increases space above and ahead of the toes. Sizing is true, but make sure you try the Lunarglide 7 if you’re using the LG6 as a sizing base. 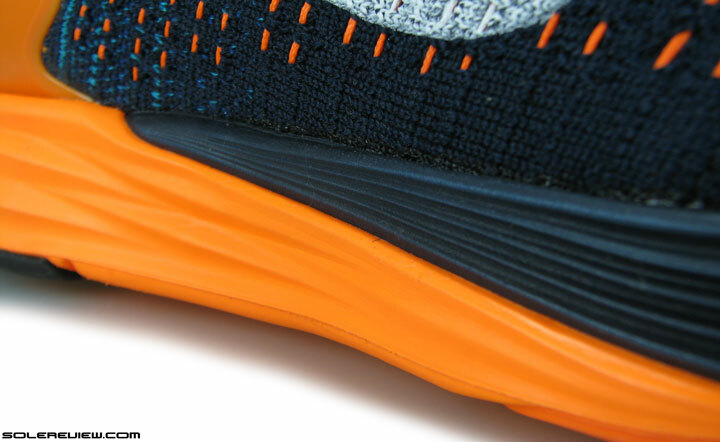 Out there in the front, the toe bumper is molded higher and less slope-y than the Lunarglide 6. In addition, the lacing moves back on the shoe by around 12 mm, freeing up more space over the forefoot. The forefoot and tongue is now a single continued component, attached by a flatlock seam. Padding inside the tongue seems to be the same as in the LG6. But the flap feels softer, as the puckered seams move away from the center. The tongue isn’t tethered to an eye-stay anymore. The forefoot and tongue forms a continuous component, which makes the tongue longer (without actually being so) as you can now stretch it better over the foot. 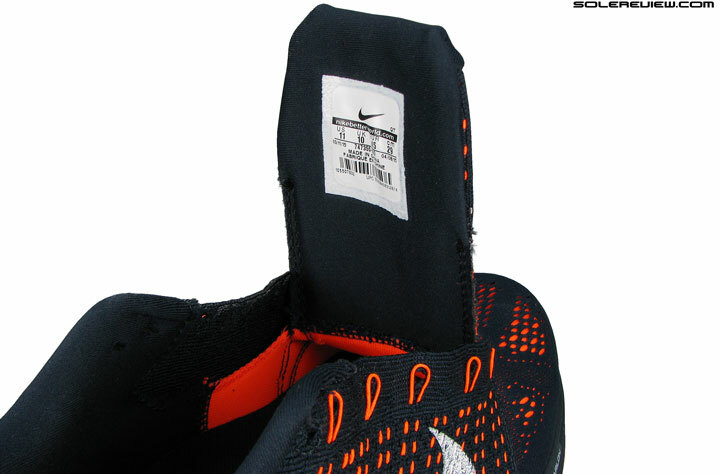 Foam padding is inside in plenty, and the flap feels more cushioned. Not so much due to the volume of foam inside, but rather due to how the puckered seams have been shortened on either ends of the tongue flap. The plastic heel clip looks like it’s borrowed from the LG6 without change. But it is a completely redesigned part. The saying that looks can be deceptive applies to the heel counter. You might be initially fooled into believing that the plastic heel clip – the rigid component which wraps around the back – is exactly the same as the Lunarglide 6. Except that it ain’t so. The updated construction takes off a lot of the invasive pressure which was felt on the Lunarglide 6. The new LG7’s (right) heel has a lower arc at the top center, freeing up more mesh outside of the heel collar. This makes the heel more softer, more comfortable to slip into. 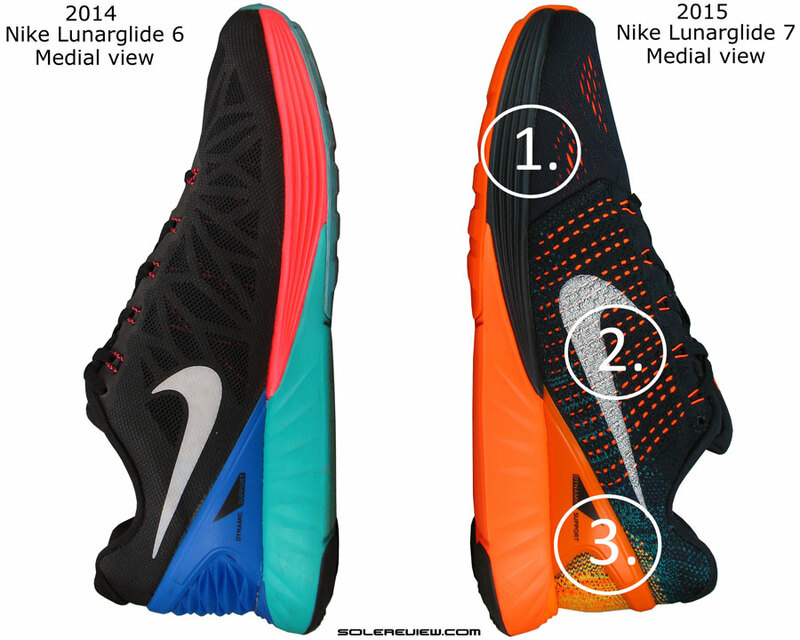 The Lunarglide 7 (bottom) has a much broader heel molding than the Lunarglide 6 (top). It is actually a brand new heel clip. It looks identical, but then begins the tell-tale signs of change. Look at both shoes from a birds-eye view, and the molding angle is a dead giveaway. The comparative picture just above shows how different both the heels are. Whereas the Lunarglide 6 had a narrow molding bordering on pointy, the LG7’s heel opens up more space alongside the Achilles. What’s more, the heel clip also sits lower, freeing up a large expanse of softer mesh above it. 1) Softer forefoot feel 2) Midfoot sleeve is removed, and the logo is completely non-reflective 3) Redesigned heel counter improves its behavior. 1+1+1 does equals 3, and the updated forefoot, midfoot and heel combine to result in a brand new upper fit. Perhaps ‘transformed’ is the right adjective to describe the change, because the LG7’s upper feels nothing like the Lunarglide 6’s. 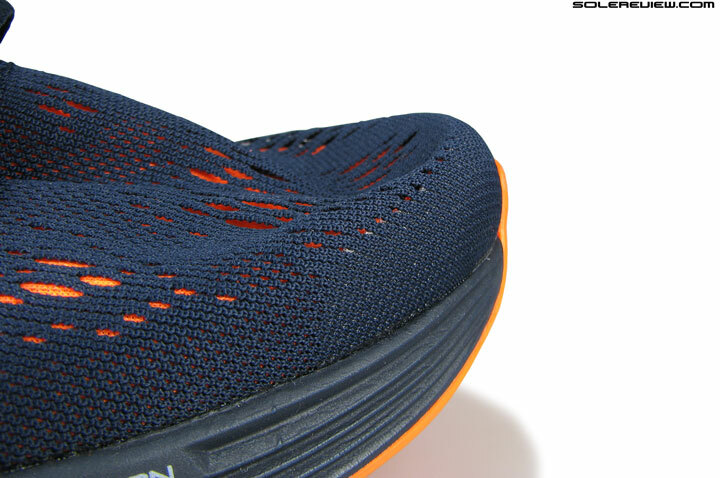 The lacing is delayed compared to the Lunarglide 6, leaving open a greater forefoot mesh area. You can begin with the front, where there’s a new abundance of space. Not only does the higher toe-bumper increase vertical space, but it also helps broaden out the entire toe-box, including space ahead of the smaller toes. And the toe-box does not work in isolation to create more room. The broader heel molding also helps the foot sit slightly backwards, away from the front. 1) Delayed lacing moves back the lacing position, and liberates space inside the forefoot 2) Slightly longer tongue 3) Heel fit has increased comfort. The lacing moves backwards, putting more distance between it and the toe-tip. When you also factor in the comparatively liberal design of the forefoot mesh, both work together to create more splay room for the foot. Remember the squishy inner lining we talked about? That makes the insides much more comfortable. The mesh has a nice cushioned feel against the big-toe, in pleasant contrast to the flatness of prior versions. 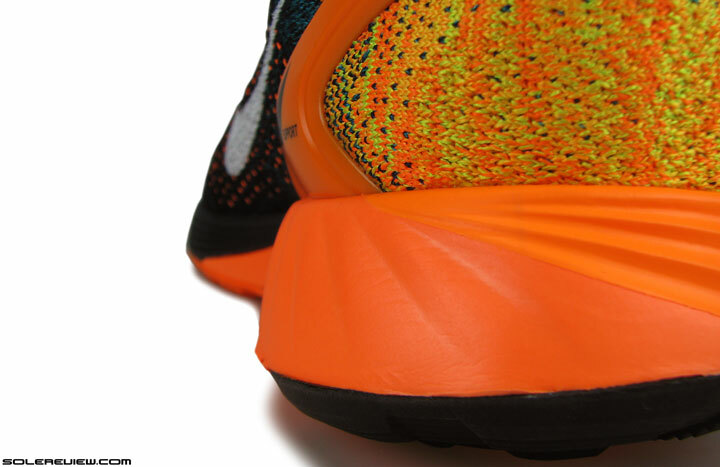 The orange lining inside has a pleasing squish-ness to it, and the forefoot snugness is toned down a lot. With a large part of the inner sleeve gone, midfoot pressure is toned down. This new fit quality is also caused by the shifting the Flywire cords to the outside instead of stringing them between the upper layers. This eliminates the pressure exerted by the strings, and instead what you get is a more conventional midfoot wrap. This has its positives and negatives, however. The midfoot feels more comfortable, yet you’ll miss the locked-down feel of the LG6. A snugger midfoot and forefoot has its advantages when you’re trying to go fast. A lower heel counter creates softer collar edges. You know, the upper portion of the heel which wraps below your ankles. That said, the more relaxed heel fit is definitely an improvement. One of the things we called out in the Lunarglide 6 review last July was the plastic heel counter’s bear-hugging grip. Either ends of the clip applied pressure on the foot in a sensation which cannot be described as comfortable. It felt as if someone was applying pressure on the base of your heel by gripping tightly with their thumb and index finger. Things ease up a lot around the collar compared to the Lunarglide 6’s aggressive hold. With the redesigned molding angle, the LG7’s heel clip does not feel as invasive as it did on the LG6. It also does two other things. As it sits lower than before, the upper part of the upper is much softer. You’ll notice this straightaway the first time you put the Lunarglide on. The collar is very comfortable, and you’ll find this year’s Lunarglide to be much more gentler on the Achilles. The second effect of the updated heel clip is on the sizing . The wider splay of its molding helps the foot slightly backwards over the shoe, and this increases the space ahead by a very small margin. We’d still stay true to size, and stick to the same size you bought for the Lunarglide 6. But some of you might do okay with a half size smaller, so try before you buy. 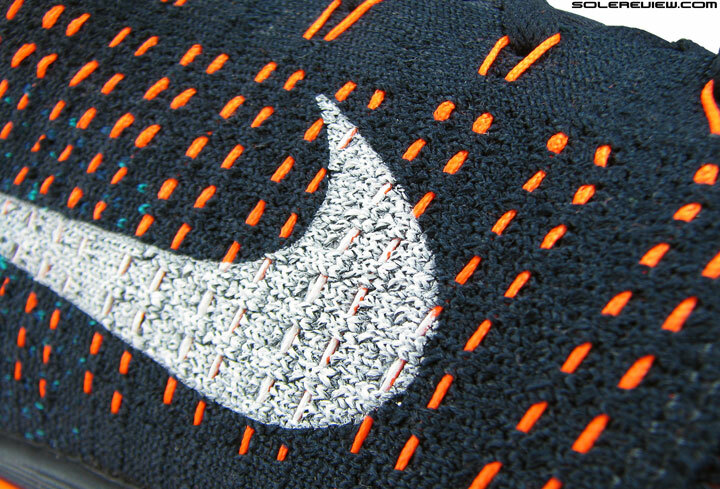 The Swoosh logo is printed like how it’s done on the Flyknit Lunar 3. Screen printed, no reflectivity. The tongue label is the only part which lights up a dark night. 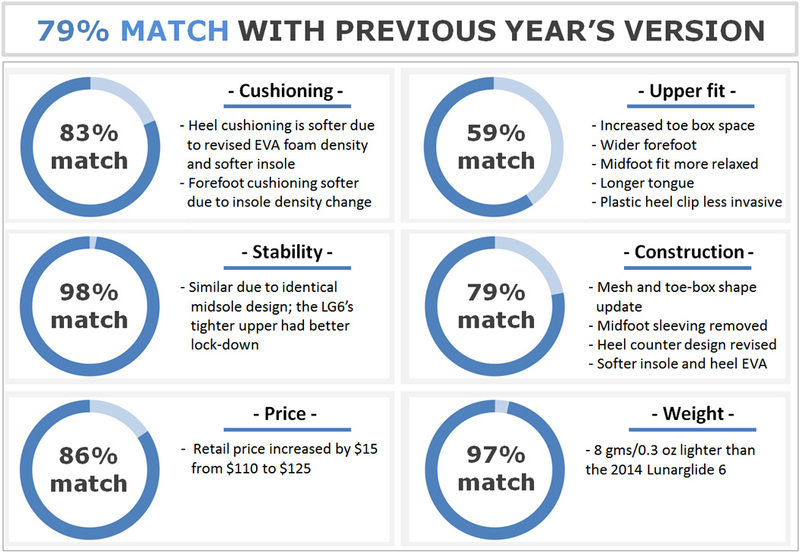 The fit might be an overall improvement, but there are few chinks in Lunarglide 7’s veneer. Last year’s side swoosh logos had some amount of (faux?) reflectivity. 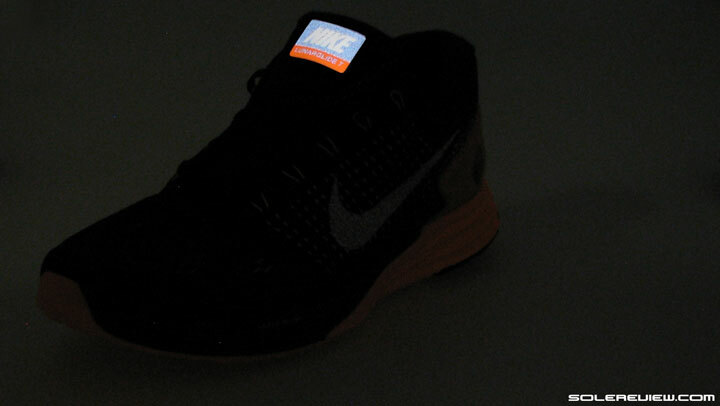 This year’s logos are plain screen printed ones, and the only thing which shines at night is the tongue label. The removal of midfoot sleeve makes the tongue a free agent, and a moderate amount of slide comes with the territory. And thirdly, the Lunarglide’s price is jacked up by over 10%, going from $110 to $125. But that doesn’t sway our opinion, which is that we see the new Lunarglide 7 as a better Lunarglide. If you found last year’s edition a tad too firm, the forefoot too snug and the heel counter too tight, then you should give the new LG a try and see how they feel. It might just be the shoe you’re looking for. The Nike Air Zoom Odyssey is a new ‘stability’ shoe introduced recently. Two thirds Structure 19, one third Vomero would be the right way to put it. Also the spiritual successor to the long gone Nike Equalon. A brief summary of the Nike Zoom Odyssey before our full review follows – since that’s a brand new product with no history. The way you should view Odyssey is as a premium version of the Structure 19. It still rides firm, but more responsive. In short, you can consider the Odyssey as an option when sniffing around Lunarglide 7. But do so in the knowledge that the latter is a motion control shoe in the traditional sense, whereas the LG7 is a neutral with a supportive aura. When shopping for the Lunarglide 7, you should also consider the adidas Supernova Sequence 8. Tighter upper than the LG, but the basic premise is the same. Kinda neutral, kinda stability. And mind you, Nike.com’s marketing description of the Lunarglide 7 has a couple of misleading claims. The page says that the Lunarglide has a ‘firmer foam on the medial side’, which is untrue. The foam density on either sides is exactly the same. 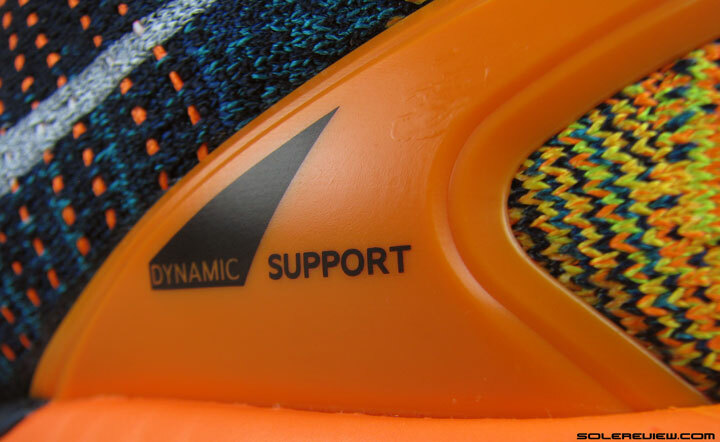 Instead, they should have said ‘soft Lunarlon core inside a firmer midsole covering’ or something to that effect. 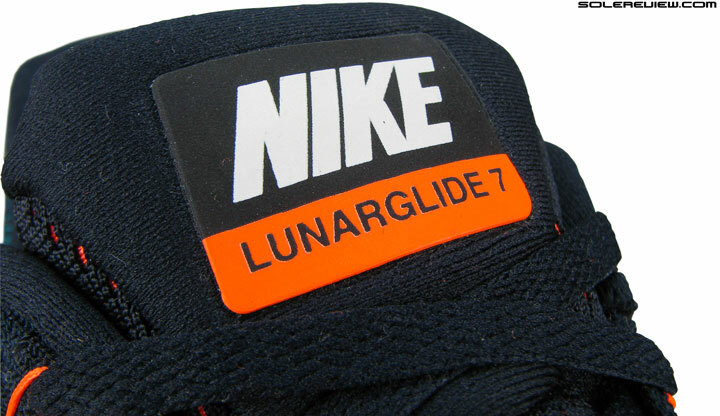 Secondly, Nike claims that the Lunarglide has a ‘plush internal bootie’. That isn’t true either, at least not in way most people know it. 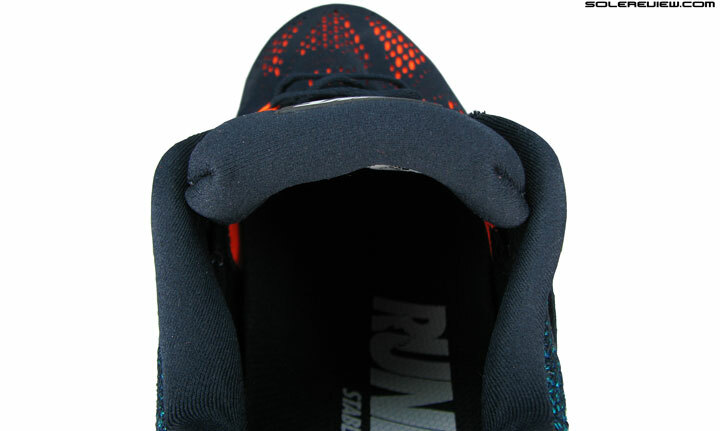 The Lunarglide 7 (unlike the LG6) does not have a midfoot sleeve, which happens to be the default expectation of a bootie construction. The sleeve begins where the tongue ends, but by that definition every shoe has a bootie construction. When you’re a 30 billion dollar company, you have to sweat the small stuff. Even semantics. 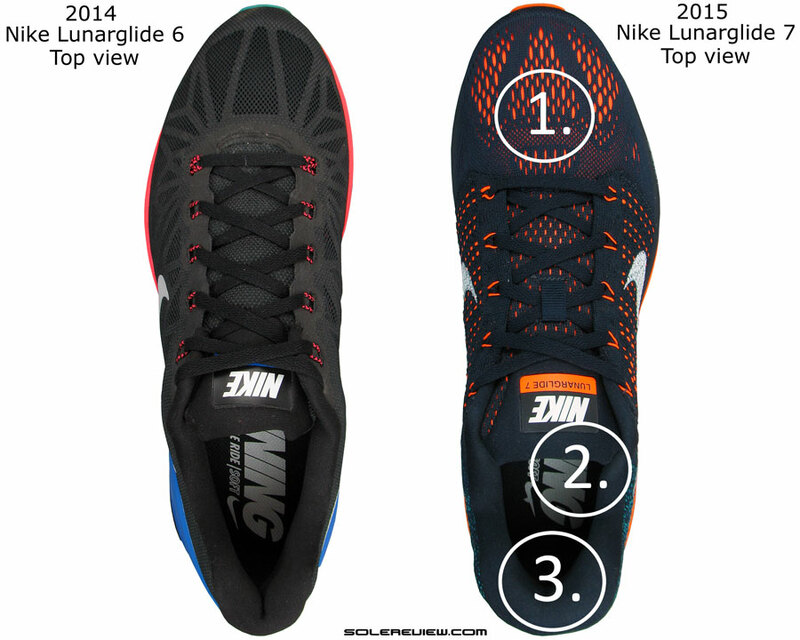 Looking to upgrade your older Nike Lunarglide 6 to the latest version, but not sure how the 2015 model compares? We can help here. The following infographic is a ready-reckoner for what changes you might expect in the new model vs. old. To make this more fun, we’ve put in a system of percentage match, which calculates a weighted average for a set of attributes. Hi, I have store credit for Nike I want to use in the upcoming weeks. I’m training for a marathon in Saucony Ride 7- I like the ride but wish it was just a tad softer. I go on long miles on a slow pace at 9:00-10:00 min/mile, and shorter runs for 8-8:30min/ mile, both on the Ride 7. I actually have New Balance 1500v1 and realized that running in them hurts my ankle/calves too much (not sure if it’s the medial support messing with my footwork or me not being used to midfoot striking). I’m wondering if I should get LG7 or Flyknit lunar 3. Is LG7 is basically more cushioned version of flyknit lunar 3? Could I expect to use FKL3 for marathon training / marathon? Have you tried Nike Pegasus? The Flyknit Lunar 3 is softer than the LG7. Also try the Pegasus 32 and Vomero 10 while you’re at it. How does the cushioning compare to the Vomero 10 and the Peg 32? The LG7’s ride is firmest of all three. Another top review. This is why I visit Solereview daily. Appreciate the kind words, and thank you so much for having our back! blurring and trespassing one another constantly. marketing tags of its brand. This is where you come in to play and enlighten us by your wear tested reviews. As im in the hunt for my next shoe any advise or tip given is more than welcome, to give it a spin im looking into the mizuno waverider , im i looking the right way? Agree, it is very confusing trying to findyour way through all these models. What exactly don’t you like about the Nimbus and Sonic? If you provide specifics, we can perhaps narrow down some options for you. Nimbus 14 -> (+)very good cushion,(-) not wide enough forefoor (even though its 2E). drives my gait to outer of the shoe. Sonic -> (-) “wooden” feeling in the back , especially right shoe, very narrow forefoot, hurts my arch . (+) more balanced gait than nimbus , responsive . Both shoes are driving me to step the outside of me feet. Based on your insights, the Nike Vomero 10 sounds right up your alley. Plenty of forefoot room, and cushioning to go. My normal size is a sizze 12 and that is what i got my fisrt Lunarglide (the 5s) in and they fit great. I also got my next pair (6s) in a 12 but had some extra room in the forefoot, a LunarTempo in a size 12.5, another Lunarglide 6 in a 12 and this pair of Lunarglide 7s I just bought in a size 11.5 which fits great. While all my Lunarglides have never been very good on grip they are pretty durable. I’m able to crank 450 miles out of all of them each time without any worries. Everything esle was spot on and I figured out why the heel felt so loose compared to the Lunarglide 6 even though the heel counters looked the same. Thank you for the detailed feedback. That heel counter had us fooled at first, but then we realized that the functional design has completely changed – without changing the look! Sorry if jump in this small discussion. SA I have to feet that new heel countr make a more loosen fet on heel and therefore less support for heel and thus less against overpronation?thanks! I’m so afraid of losing the feeling of my beloved LG 6 ? change the shoe if – 1) the cushioning or support feels lacking 2) the outsole has seen excessive wear 3) The upper is damaged in someway. Many runners use their shoes for 1,000+kms without any issues. Back from the shop with my first brand new pair of LG7. Well, admittedly I did not yet finish with my 2 previous pairs of LG 6; but since there was a 30% discount just today I bough already a pair of LG 7 to see how they work. Not yet run it them but actually I’m a bit shocked how loosen the top feels on compared to the old LG 6. I also noted that if I pull more the strings and use the 7th eyelet it looks a bit more locked. Dear Solereview, and followers, do you suggest using the 7th Eyelets? And if yes, bound it normally or doing another eyelet with the laces itself. I tried both and for it seems better using only the shoes Eyelets for more locking feeling. Thanks as usual! I will slowly start running in them keeping the old LG 6 for few dozens km since I noted there are getting a bit soft. Do the another eyelets with the lacing (heel lock) if you feel the upper is still loose. Otherwise tying them normally on the last eyelet is ok. Thanks! I will try. In the past I laced my LG6 normally. So I do not have much experience with these heel lock lacing(and thanks also for telling me the name;)) . Yesterday though I tried and I felt less tightness with this heel lock lacing than simply pull the laces as usual. Strange. Maybe I have just to practice a bit! Thanks for helping! Btw I did not use the heel lock lacing on Lg 6 sincere there was not the hole to do that.??? Interesting that instead they added it in LG 7. This might be an evidence that as your splendid review immediately noted the top lost the tightness of the LG 6! ? Sorry it took a while to get back to you, but I change my shoe whenever it starts to feel a little less supportive and less responsive. If the shoe flexes a lot easier than when you first bought it that can also show some wear a tear. But the lunarglides can last a long time. I would be careful however past 500 miles or 800km (i believe) since in my use the rubber at that point has been worn down a lot. As for tempo runs the lg7s will be just fine. I went on a rather quick run a few days ago without any real issues. Agree with what Tom says below, would not worry about the heel clip. If you experience any looseness, then the last row of lacing should fix it. Enrique, thank you so much for your offer of support! Paypal is infamously notorious for holding/blocking crowdfunding proceeds, and that is why a lot of campaigns stay clear from offering a paypal option. Indiegogo is every bit as secure as Paypal, because their third party payment processor is Stripe. Indiegogo does not process the payments/credit cards directly. Feel free to use our facebook page for questions and comments! Understood. Many thanks for your reply. Will then proceed to process my payment thru Indiegogo. Best, Enrique. We’re extremely grateful for whatever support you can provide us! LG6 and turn to LG7 I wanted to hear your view. because I was thinking that maybe I kept on needing some stronger support. feeling or is some backed by technical logic? a slight annoyance to fascia lata on the same leg of the issue with Achilles tendon. training than because LG6 are not the shoes for me. is so massively different form Lg6? Thanks in advance for your time! No, thank YOU for the kind words and for supporting us on Indiegogo. Extremely grateful, Amilc. Happy to note that the LG6 served well for you during the training, and then running the half a few times! And by the way, it is perfectly normal to feel a higher level of responsiveness with increased speed. That happens because the foot strikes the midsole at a higher speed, but does not stay there for long – so materials like adidas Boost, Nike Lunarlon/Zoom or UnderArmour charge foam feel responsive because of springback. At slower paces, this experience is toned down because the foot tends to ‘stay’ on the midsole longer – and hence the softer feel instead of responsive. Compared to the LG6, the Lunarglide 7 has the softer cushioning and more comfortable heel area going for it. But in the front, yes, you will miss the lock-down – something which feels better when going faster. So ultimately you have to decide what is more important for you – softer cushioning or tighter upper. If you prefer a tighter upper, then LG6 it is. The fit is very different from the LG7, yes. Give it a try at your nearby store, that should help make up your mind! Thanks! This is why you need all our support. Another little question and then I stop. But so you think that considering my past experience with the LG 6 if I’m only able to find a LG 7 this would be the model I should look to as my next shoes or better I search elsewhere as models and brands? If you can’t find the LG6 anymore, then yes, LG7 is the shoe you should buy! The UnderArmour Speedform Gemini is another shoe which comes to mind, though it is a different shoe from the LG6 in fit and feel. The common trait is that the Gemini’s a supportive neutral shoe. Would a neutral runner be fine wearing these shoes? Yes. But like any other shoe, some people will like it, other won’t. That is true. I also have another question, does the lunarlon foam feel different when running in it? Specifically, does it get a little firmer? I have tried on the lunartempo and it I felt like I was really sinking into it while walking around, does it feel like that when running in it? Thanks! Just by changing your pace, most shoes will feel different than walking in them. For the simple reason that the foot tends to spend a whole less time during a running motion (quick touch and go) versus walking, where the loading take a while longer. This makes most shoes soft at standstill and slightly responsive during running. And mind you, a lot of ‘first impression’ cushioning feel comes from the soft insole – this will flatten out during faster foot strikes, and make the shoe feel firmer. But if you’re asking whether the Lunarlon changes its properties while running, then the answer is no. So I have a completely neutral left foot strike. However my right foot over pronates a bit and has caused me some issues. What shoe do you recommend me for my work(8 hours on my feet about 7 miles walking daily). I wan’t something light and soft and I thought after your review that the pegasus 31 is the right shoe, but that is a neutral shoe isn’t it going to cause me trouble or not? So isn’t it safer to buy a stability shoe like the lunarglide 7 or the lunareclipse 5 or asics gt 1000 v.2 or mizuno wave inspire 10? We would not worry about the pronation bit. The Pegasus 31 and Vomero 10 are great options for the activities you’ve described. There are many shoes with smooth interiors. You could try the Brooks Glycerin 13, Nike Free 4.0, Nike LunarLaunch, Nike Pegasus 31/32, New Balance 1500 v1, UnderArmour Speedform Gemini. Thanks for the suggestions, I will look at the reviews of each one you listed. Thank you so much for this great review! Really informative! But it’s raised a question in my mind. I got a pair of LunarGlide 5 shoes in Sept 2013. I love them, but after 18 months I’d run almost 900 kms in them so needed to replace them. They never caused me any trouble, and I had never had any problems with injury with any previous shoes. But when I replaced them in Feb 2015, I got a pair of Adidas Supernova Sequence 7 Boost. They were great at first but after a few months I got a knee injury, which I’m still recovering from, 6 months later. The physio thinks that my Boost shoes may be too stiff, and that they may be partly to blame. I’d like to get another pair of Nike LunarGlides, but I’m unsure now, after reading that the current LunarGlide 7 model is constructed differently from the old 5 model. It sounds like they may not be as flexible (?) and so I worry this may be a problem for me if my stiffer, more supportive shoes contributed to my knee injury. They LG7 sounds better than the LG6, but quite different from the LG5 that really worked for me. Any thoughts about whether the LG7 would be good for me? Thank you for the detailed comment. It is really hard to say whether the Lunarglide 7 will ease your knee pain, different runners react in different ways to running shoes. Your physio knows best, but our advice (take it with a grain of salt) is this: Strengthen/conditions the muscles which act as a supportive group to the knee, that should help more than the choice of the shoe. The comments/Q&A thread will be closed till January 17, 2016. Any inconvenience is regretted. Premium access members can use their dedicated comment section, which will be open. I run in Nike Eclipse 3 shoes for 3 years now and i want to now if i can replace my shoes with LG7. The LG7 is much firmer, but you can give it a try. Also consider the Nike Air Zoom Odyssey. I have a problem ,i was trying to run in Pegasus 31 but i have develop pain in left and right leg (knee pain in right leg),so i go back to Eclipse 3 and now they are discontinued and i have a problem to find replacement.I run also in Adidas Sequance 7 and Asics GT 2002 and also develop pain in right leg.Before Eclipse line i run in Nike Structure 14,15 and Lunarglide 3 and 4.I have normal arched feet .My problem is right leg,on right leg shoe the weare is in heel inside but not on left leg shoe.So i have more problem with my right leg(knee pain).I try eclipse 5 and lg 7 and the pain is right there in right leg(knee). If you’re experiencing pain, suggest that you see a physio. It might not be due to the shoe, but other reasons. Hi, Thank you for your review. I would greatly appreciate if you could provide me with an advice, as I am rather novice in terms of running shoes. I have flatfeet and mild to moderate hallux valgus which makes it a bit more difficult for me to chose appropriate shoes for casual running. I was wondering whether Nike LG 7 or 6 would be a good choice. Thanks for reading the comment and I really hope you could make some recommendation. We’d side with the LG7; more room inside and softer too. Thank you so much for your reply, that’s very useful! I will give them a try. Hello. I was also wondering whether you have tested Adidas Lightster 2…I think they were launched in 2014. I am sorry if this is a bit off topic, but I did not find a review for them here on the site and I would have liked to see your opinion on them. Thanks for the suggestion, Marcela, but we haven’t reviewed them. Unlikely to do so either, sorry! No problem, thank you for the quick response. Hello, I currently run with the nike zoom pegasus 31 and recently had some issues on the upper side of my right foot. I went to the doctor and he found I overpronate on right foot. 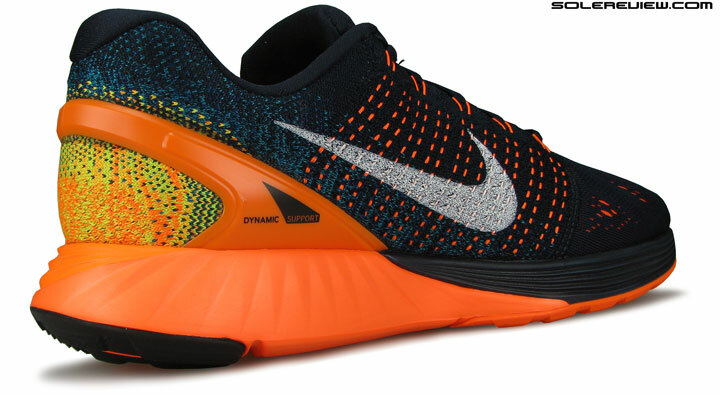 Are the lunarglide 7 good enogh for my overpronation issue, should I stick with my pegasus 31. What other (Nike) shoe you recommend? Thanks!! Not sure whether the Lunarglide 7 will help with your issues, but it definitely has more support than the Pegasus 31. Also worth trying the Nike Zoom Odyssey. Which provides better support for flat feet. LG7, Zoom Structure 19 or Zoom Odyssey. Im using LG6 at the moment and like the soft feel of it. However my left foot (which is flatter and overpronates more than the right) aches on the ankle facing outside. Not sure if this could be due to lack of support. 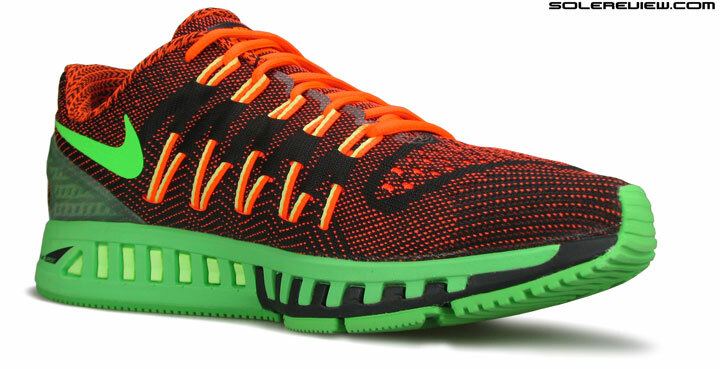 The Zoom Odyssey is the most supportive of all three, and does not compromise on cushioning. I’m struggling with plantar fasciitis due to flat feet and subsequent overpronation. I’ve been buying adistar boosts for 2 years now and had no issue until now. I’ve been recommended the lunarglide, but wanted to know what you guys thought? Sorry Alex, it is hard to say whether the LG7 will be suitable for your condition – injuries and footwear react in different ways depending on the person. Generally speaking though, would these be better than the Adistar boost for arch support and overpronation? Can’t say, we haven’t tested the adistar Boost, Alex. In my experience, no. Having worn both, the Adistar Boost controls more pronation than the lunarglide does. how is the ride compared to the stability of mizuno wave inspire 11? is the outsole grip really that bad? The ride quality is softer than the Inspire 12, and the shoe feels faster due to its lower weight. 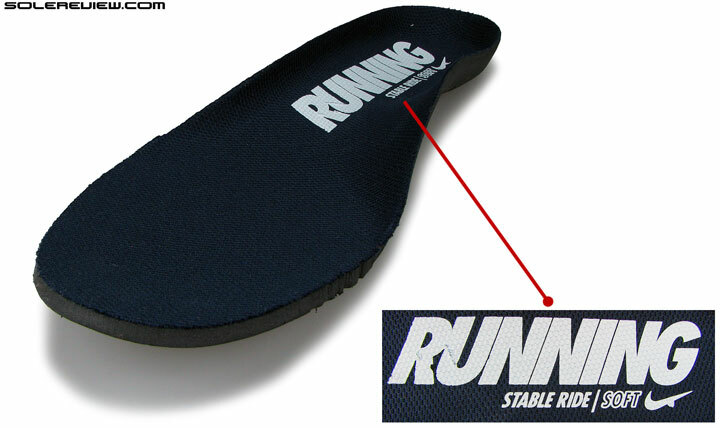 The outsole grip is bad on wet surfaces, otherwise it does ok on dry roads and flat trails. Do you have any first impressions to share of the Lundarglide 8?